Twelve cobra species live in Asia. In contrast to African cobras, who exhibit great adaptive diversity, most Asian cobra species are similar in behavior, lifestyle and habitat preference. The prevalence of cobras in Asia is reflected by their frequent appearance in the region's religions and mythology. Except for the king cobra (Ophiophagus hannah), all Asian cobras belong to the genus Naja. Formerly, all Asian species of Naja were considered subspecies of a single species. This changed when researchers Wolfgang Wuster and Roger S. Thorpe began splitting the species into its current form in a 1989 paper published in the "Biological Journal of the Linnean Society." Meanwhile, king cobras form a distinct lineage, and arose independently of the "true" cobras as demonstrated again by Wuster and colleagues in a 2007 paper published in "Molecular Phylogenetics and Evolution." While the study examined the mitochondrial DNA of several different cobra species, this evolutionary divergence is also reflected in morphology and diet. King cobras are among the most famous snakes, and for good reason; reaching 18- eet in length, they are the longest venomous snakes in the world. Capable of raising up to a third of their bodies when hooding; really big king cobras can look a human in the eye while displaying their hood. Unlike typical cobras, which have short, wide hoods, the king cobra spreads a long narrow hood. Additionally, while some cobras, such as African black spitting cobras (N. nigricollis), do consume snakes occasionally, king cobras predate other snakes almost exclusively. King cobras do not spit venom, instead they rely on their size, cunning and deadly venom for protection from predators. Monocled (N. kauthia) and spectacled cobras (N. naja) look alike in many respects, except that their hood markings differ. Spectacled cobras -- long favorites of snake charmers -- have eyespots on the dorsal side of their hoods; meanwhile, monocled cobras have only one eyespot, on the rear of their hoods. One important difference between the two species is that the monocled cobra has morphological adaptations that allow it to spit venom accurately, while the spectacled cobra does not have the specialized fangs necessary to do so. Despite this, monocled cobras are not known to spit very frequently and are considered “non-spitters” in older literature. The spectacled cobra is found throughout the Indian subcontinent, while the monocled cobra is found to the east, as far as Thailand. Nine other species of Asian cobra inhabit the eastern and southeastern portion of the continent. The Indochinese spitting cobra (Naja siamensis) of Thailand, Laos, Vietnam and Myanmar, is an irritable snake who readily spits at his adversaries. The Sumatran cobra (N. sumatrana) and equatorial cobra (N. sputatrix) are variably colored spitting species of the Malaysian, Javan and Sumatran rainforests. These two species were among two of the first forms to be examined and given scientific acknowledgement by Wuller in his 1989 paper. 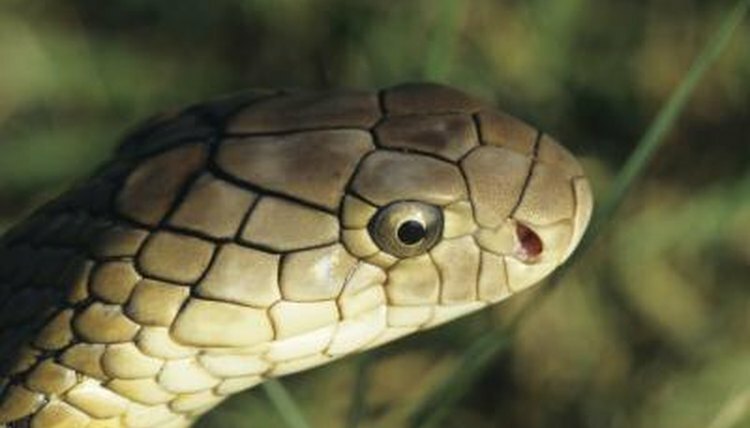 The Chinese or Taiwanese cobra (N. atra) was the focus of a snake-bite study by OF Wong and colleagues published in a 2010 "Hong Kong Medical Journal." The Philippine cobra (N. philippiensis) and the Samar cobra (N. samarensis) inhabit the forests of the Philippines, preying on rodents and amphibians. The Adaman cobra (N. sagittifera) is a lowland snake who inhabits the Adaman islands in the Bay of Bengal. The Caspian cobra (N. oxiana) is found farther west than any other species of the Asian cobra, inhabiting arid landscapes near the Caspian Sea. The Burmese spitting cobra (N. mandalayensis) is one of the smallest cobra species; adults rarely exceed 3 feet.